« Where are the local aid and development worker blogs? 14 years ago today it was a chilly December morning in Barrio Candelaria, San Salvador. I’d spent the night before doing something mundane yet extraordinary… giving birth to a baby girl. She was still a little blue that morning, having had a tough time making it through to the light of day. Being born when you weigh 10.5 pounds is not an easy thing for a baby, or for a mother. But she was nursing and we had her wrapped up in a warm blanket and a little hat. Niña Lita, my elderly midwife, stopped by around 7 a.m. that morning to bathe the baby, Clare, in the customary rose and rue to ward off any evil spirits or bad vibes. She had come back early in the morning rather than waiting till later because she was concerned about us. The night before she was worried that neither of us would survive. She didn’t say so of course, but it was clear from her eyes and the lines of concern on her face as she helped us through the short, 4 hour labor. I had gone to work on the 13th, the last day before Christmas break. My stomach was so big it was hard to eat or breathe. The baby was taking up all the possible space in my abdomen. I grabbed the bus home as usual, made dinner, read my son his bedtime story, and got ready to sleep. Around 11 I felt the first labor pains and called Niña Lita. She had attended me with my son Daniel (see my 18 years post) and had been coming around every month to ‘sobar‘ me – massage my stomach – and check in on how I was doing. I’d been to the ‘real’ doctor a few times also, but the pervasive medical approach in El Salvador at the time was a mix of fear and pharmaceuticals and that wasn’t my thing. So my pre-natal care was pretty infrequent and I was mostly just going through the motions. As with Daniel’s birth almost 5 years earlier, I had decided to have my baby at home in the small room attached to our bedroom. We didn’t have the money for me to go to a private hospital, and the public hospital horror stories had me turned off. I wanted a natural birth with my family nearby. I wanted to breastfeed immediately and keep the baby close at all times – things that the public hospitals didn’t promote at the time. 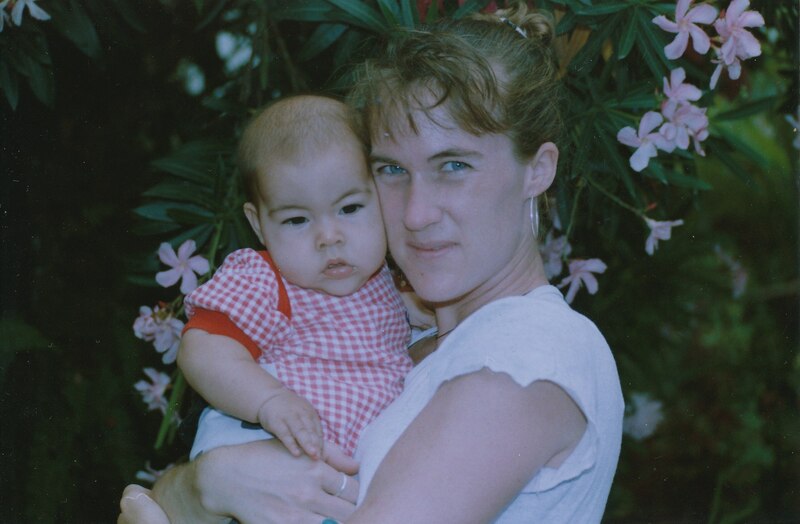 Niña Lita arrived around midnight with her daughter A., a registered nurse who owned a hair salon down the street (and who had a mafioso for a husband – I learned last time I was in El Salvador that A. and her husband are in prison.) She made me some cinnamon tea to help speed up the labor, and I promptly threw it up. It was freezing in the house and the power was being funky so we relied on the flickering lightbulb and kept the candles handy. My mother-in-law was next door, I later found out, awake and vigilant, lighting candles to la Virgen and on her knees praying for a safe birth. She later said she’d had a bad feeling. My husband and Daniel were in the next room, dozing off and waiting. Labor came hard and fast, but then the pains stopped despite the fact that the baby hadn’t arrived. She had crowned but she was stuck. I looked at Niña Lita, in pain and wondering what was happening. What was I supposed to do now? I wanted her to fix something, to make it better. She worked her calm magic, carefully reaching inside and untangling the baby’s umbilical cord from around her eyes and her neck. Random and harried thoughts marched through my head as I waited. Wondered. Time stopped and everything was silent. Then she gave me a penetrating look. ‘Tenés que empujar mamita. You have to push, mama.’ ‘No puedo, I can’t.’ ‘You must.’ There were no longer any labor pains to help me out but I managed. Finally the baby was born and relief set in – until I propped myself up a little more and looked down between my legs. A big baby. A girl. Her chubby body from the neck down was a beautiful rosy pink…. but she was still. Her entire head was bluish purple, her eyes swollen and puffed closed. Oh God. She’s dead. Not possible. Not happening. Why? Why am I so stupid and stubborn? Why did I insist on having a baby at home?! This can’t be happening. A. cradled the baby while they cut the cord and cleaned her up. She was a bit scary looking, with her blue face and head attached to a chubby, healthy, pink body. Niña Lita put a little white hat on her and swaddled her up and gave her to me. She immediately started nursing and the fear left me. I knew she would be OK, despite her funny looking blue head…. it was about 5 a.m. and the sky was just starting to lighten. My husband had come in from the bedroom to see the baby and pay the midwife. He had no idea of the tragedy we had just avoided. I heated up some water and took a bucket bath – I was exhausted and shaky. I crawled into bed with him and my son and Clarita, relieved. My parents-in-law came over early to see the new baby and word spread quickly through the Barrio. My mother-in-law held her and gave thanks to la Virgen Maria. 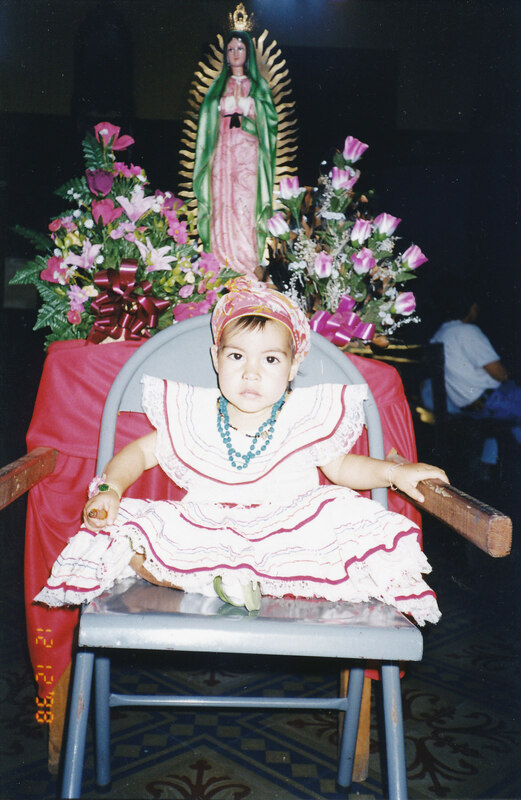 The night before she had promised that the baby would be a child of la Virgen, and that she would keep the tradition of celebrating the 12th of December – the feast day of La Virgen de Guadalupe. The visit to bathe Clarita left Niña Lita feeling relieved also. ‘Estaba bien preocupadita mamita,’ she said, ‘I was very, very worried.’ We got the scale from the corner store: 10.5 pounds. No wonder, we all thought. No wonder. The following day we took Clarita over to get her first vaccines and her foot prints at the local health unit. ‘Where was the baby born?’ ‘At home.’ ‘En casa? ohh.’ ‘And how old is the baby?’ ‘2 days.’ ‘2 months you mean?’ ‘No, 2 days.’ ‘A baby of this size? Are you sure? Let’s weigh her. 5 kilos?’ They looked at me suspiciously. They looked at each other. Clarita was big, healthy, pink and strong. I was in good shape with no belly sticking out. I wasn’t wearing socks and didn’t have cotton in my ears as would a normal Salvadoran woman who had just given birth. I was very obviously a white woman. The baby looked very Salvadoran. ‘Would you like to have an exam?’ ‘No.’ ‘I think we should examine you. We need to examine you.’ they insisted. I realized they didn’t believe this was my baby. I agreed to the exam… certainly I didn’t want anyone accusing me of child trafficking. I passed the exam and went home for my 40 days of rest…. Well, actually I didn’t get that, but that’s another story. Birth was only my first big scare with Clare. There were a couple other times that I thought I was going to lose her. When she was 9 months old I took her to the clinic to get her MMR vaccine. I was walking home with her, and after a couple blocks her skin began to mottle. Then she fainted. I rushed back to the clinic with her, knowing that she was having a bad reaction. The doctors were nowhere to be found. The nurses were slow and bored. They thought I was overreacting. ‘She probably was scared of the vaccine.’ ‘No, this is something else. She didn’t even cry when she got the vaccine. She’s having an allergic reaction. Please can you do something?’ ‘The doctor isn’t here yet. Sit there and he’ll be in.’ ‘No I need something now. Do you see her? She needs something now.’ Eventually one of the nurses took us into an examination room and gave her some Benedryl while they searched for a doctor. Luckily the Benedryl worked, and she was fine. It felt surreal walking out of the clinic into the warm sunshine, birds singing. Once she was feverish and dehydrated and the hospitals were closed. We had to wait until the next day to take her in. Meanwhile my mother-in-law took her to a traditional healer. Trying to leave for the doctor, then, we had a huge family fight because my in-laws said the healer said that Clarita had to stay inside because any air blowing on her would kill her. My husband and I wanted to get her medical attention as soon as possible. It escalated into a rift that was difficult to subsequently repair between my husband and my father-in-law. An argument of tradition vs ‘modernity’. Quien crees que sos, con tu esposa chelita y tu título de bachiller? Who do you think you are with your white wife and your high school degree? Crees que sabes mejor que tus padres? Do you think you know more than your parents? My mother-in-law always counted on la Virgen to keep Clare safe and sound, and though I am not religious, I’ve always taken great comfort in her ability to pray. 14 years later Clare is still a survivor. She’s smart, strong, independent and beautiful. Beginnings always shape things and Clare’s beginnings shaped her. They shaped me. They shaped all of us. Simply. Beautiful. Thanks for sharing, Linda. I love this post. Thanks so much for sharing.